Long-term population trends indicate the economic vitality of areas within the Mountain Resources Commission (MRC) region. Over time, people migrate to places offering economic opportunity, and the population of places with less-resilient economies tends to stagnate or decline. In 2010, 1,357,675 people lived in MRC counties – 14.2 percent of the state’s total. 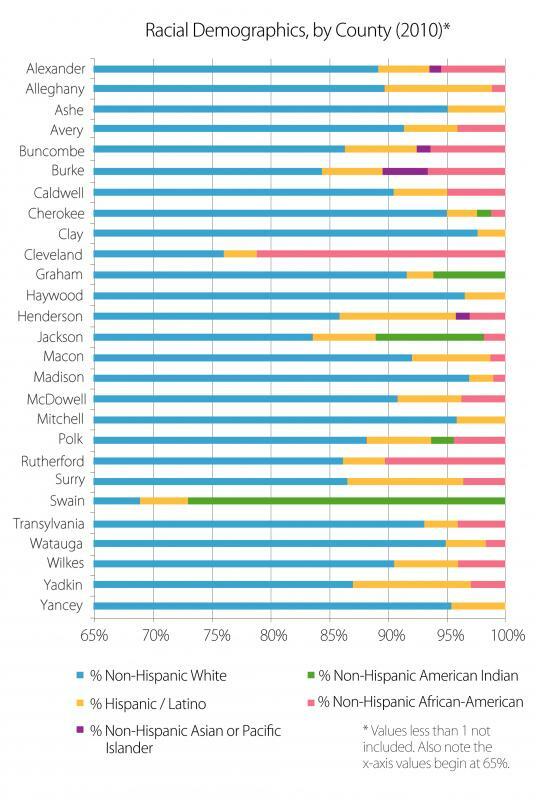 Nearly half (45.5 percent) of the region’s population lived in just five counties in 2010: Buncombe, 17.6 percent; Henderson, 7.9 percent; Cleveland, 7.2 percent; Burke, 6.7 percent; and Caldwell, 6.1 percent. Although about 30 percent of the region’s population is located in the Asheville Metropolitan Statistical Area, the region is predominantly rural, with a region-wide population density of about 121 people per square mile – only 61.7 percent of the state’s average population density of about 196 people per square mile. By land area, the smallest county is Clay County (214.7 square miles) and the largest is Wilkes County (757.2 square miles). Buncombe (pop. 238,318) and Henderson (pop. 106,740) Counties have the largest populations, while Graham and Alleghany counties have the lowest populations, with 8,861 and 11,155 people, respectively. 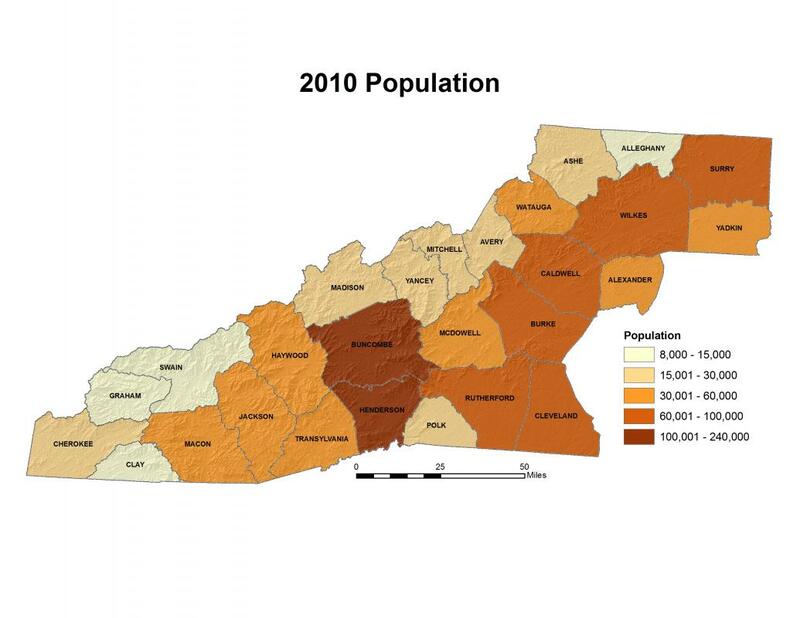 Swain and Graham Counties have the lowest population densities, at 26.5 and 30.3 people per square mile, respectively. 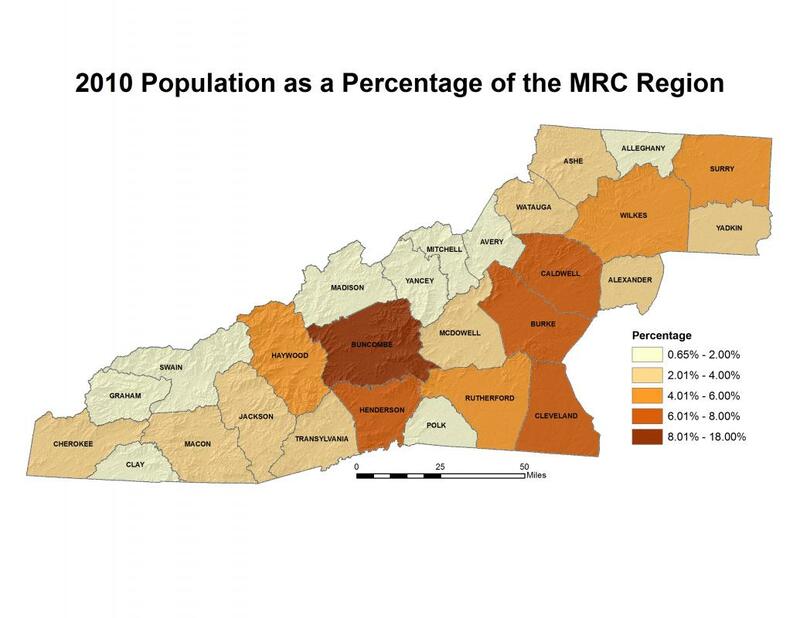 Racial distribution within the MRC region varies greatly from the distribution exhibited among the state and national estimates, and also varies among the counties within the region as well. The most prominent race within the region is white, accounting for 88 percent of the total population – compared to state and national estimates of around 65 percent. Black/African-American, Hispanic/Latino, Asian, and other races account for nearly 12 percent combined in the region, whereas the state and national estimates for non-white races each account for significant portions of the population – nearly 35 percent when combined. A prominent variation among the racial distribution within the MRC region can be seen in Swain County, which has an American Indian/Alaskan Native population of over 25 percent, and within Jackson and Graham Counties – at 9 and 6 percent, respectively – due to the presence of the Qualla Boundary, the territory of the Eastern Band of Cherokee. Cleveland County, too, has a black/African-American population at nearly 20 percent, a distribution estimate much more similar to the state’s estimation. U.S. Department of Commerce, United States Census Bureau. 2010 Census Files. DP-1, DP-2, DP-3, DP-4, and DP-5. Accessed from: http://factfinder2.census.gov/faces/nav/jsf/pages/index.xhtml.